2 Blks from GUADALUPE RIVER , Tube Rentals & GRUENE HALL & COMAL RIVER 5 mins. Approxmately 9.5 miles from WhiteWater Amphitheater. Just minutes from the Comal River and Schilitterbahn. Come and enjoy our home with a country atmosphere. Enjoy nature's wild life, relax under large trees on 3 wooded acres. 2 Night Min Week Nights and Weekends. 2 blocks from Guadalupe River, River Outfitters, Historic Gruene and Gruene Hall. The house was very clean. We really enjoyed the outside fireplace/patio area. Pam & Scott are very nice. Our family of 9 adults had plenty of room to spread out. It is an older home but very cute. It has an awesome patio area with a fireplace. The carport area has other seating, also, with a ceiling fan and picnic tables. We really enjoyed the roomy kitchen and living room. The house is super close to the river and Gruene. The owners are renovating another house on the property, and there is a smaller house that has two bedrooms/one bathroom that they rent out, too. We would not hesitate to stay again—the photos don’t do it justice. Only thing I would add is small bars of soap for bathtub and shower. The owner is very easy to contact for any problems. Try it—i’ll bet you’ll love it! I stayed here for my 27th birthday with a few friends and it was the perfect spot. The location is extremely convenient to the center of Gruene, and tube rentals for floating are just down the road. 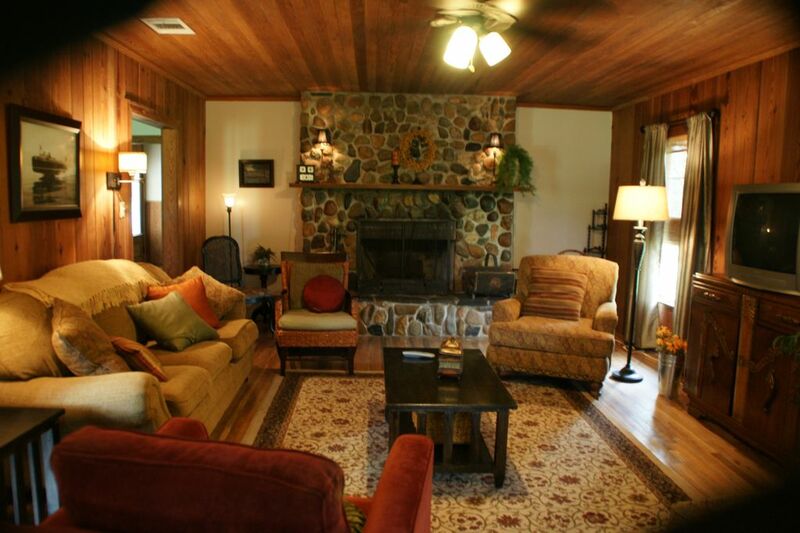 The house fits 12 comfortably and has all the amenities you need for a large group stay. Will definitely try to plan a trip here again. Larger than I expected. Very clean & charming. Would definitely stay again. Extremely close to downtown Gruene, but we still drove because there is quite a bit of traffic. Looked better than the pictures! Beautiful house and property! My large group had more than enough room for everyone! We'll DEFINITELY be back! Thanks Pam! 3 Nights for all Holiday Weekends, Rates are subject to change until reservations are confirmed. Ask about our off season rates.